Oh, not out of comics, mind you--my habit has remained firmly in place, more or less, since 1982--but rather, 1989 through 1992 really are my "Marvel Zombie" years. Aside from my first real dipping in the "indie" comic pool with NOW Comics' Fright Night (adapting the film of the same name, following the two leads after), these years were filled with nothing but Marvel books. On the plus side, I learned to really pay attention to the credits in the interim, largely due to the artistry of Todd McFarlane and the hubbub surrounding his leaving Amazing Spider-Man for a Spidey book all his own in 1990. It wouldn't be until late 1992 when I came back to the DC fold. You all know the event, I'm sure: the death of Superman! However, Firestorm was noticeably absent from the big funeral scenes. Why? But yes, this blog is about Firestorm--at least it is today--and that means I eventually found my way back to ol' 'Stormy. I'm not really sure, but I think I came back in the fold in late 1994. At the time, I was buying comics out in Boardman, Ohio, at Rainbow Comics & Cards. (Another place I'm not sure is even there anymore.) I remember buying the Advance Comics catalog--one of Previews' competitors, I'm sure--and one month the DC previews showed Extreme Justice #4, one of the Justice League of America spin-offs from those days. And Firestorm was back. So the next few months--from the announcement of the book for pre-orders, on through the appearance of the actual book--were a firestorm (pun intended) of activity from me. (To this point, I'd only bought four back issues of Firestorm: the first issue from '78, the first issue from '82, and issues 51 and 52 because Firestorm fought some giant reptilian monster in them. Ironically, the latter informed my knowledge of Eddie Slick, the Sand Demon from my last entry.) I don't quite remember the order in which I assembled the majority of my Firestorm collection, but it occurs to me I started by picking up the remainder of John Ostrander's run; in fact, I remember buying back issues at New Dimension Comics in Cranberry Township. Specifically, I picked up the Svarozhich arc from #82-85 early on, as well as the finale, the triple-sized #100. I'd buy most of the rest at that same shop, with an excursion to Eide's Entertainment in downtown Pittsburgh to fill in the final gaps. As I remember buying those earliest, I'll review the end run before tracing everything back to the original Gerry Conway run in my fourth entry. During the Invasion! crossover, one of the alien Dominators detonated a Gene Bomb, isolated from the human metagene, whose catastrophic effects were felt by every super-powered human on Earth. In Firestorm's case, his nuclear powers blazed out of control and resulted in many deaths before the Gene Bomb's effects were negated. Traumatized, Firestorm then refused to come out, and any attempt by Ron or Mikhail to initiate the merger would cause both of them intense pain. This unfortunate event was shown in #82, when in trying to save Lorraine "Firehawk" Reilly from the second Killer Frost, Ron ended up having to save her himself. Unfortunately for them, Ron and Mikhail couldn't understand each other outside the Matrix (Mikhail only spoke Russian), so they had to rely on Serafina as a psychic interpreter. Upon meeting Gregori Eilovotich Rasputin ("perhaps" the Mad Monk of Russian legend; actually a substitute for John Constantine), the final pieces of who and more importantly what Firestorm was finally came together. In "Soul of Fire," Ostrander framed the improbability of Ron and Martin having survived a nuclear explosion and become Firestorm in the same vein as Alan Moore framed Alec Holland's absurd resurrection as Swamp Thing five years earlier in Saga of Swamp Thing #21's "The Anatomy Lesson." Without directly aping, he established that Firestorm's origin was truly the advent of a new Fire Elemental, as Swamp Thing's was the introduction of an Earth Elemental. The Matrix enveloped Ron Raymond, but it was Martin Stein who was the intended recipient of the elemental force! This was about the time where today I would say, "Mind=blown." How much sense it made to have Stein's mind as the template for the "new" Firestorm of issues #65 onward! Firestorm #85 marks the maturation of the core concept of the character in a genre that is largely resistant to change, so I'm not altogether surprised when "purists" of the character condemn this period in the character's history. However, for something that according to Ostrander wasn't planned at the time of the "new" Firestorm's introduction twenty issues before, the new status quo of Firestorm as Fire Elemental fit like a glove. Along the way we did lose another key conceit of the original series in that, to create the new Elemental, Ron and Mikhail had to give up their individual identities and be entirely subsumed in Firestorm's new persona. It wouldn't be until the finale in #100 that we saw Ron or Mikhail again. Over the next dozen-plus issues, the new Firestorm, in a totally new and altogether unrecognizable design by artists Tom Grindberg and Tom Mandrake, would find himself wrapped up in environmental issues, vacillating between his care for humanity and his elemental natures that would see the Earth wiped clean from pollutants (and evil corporations like Sunderland, in another echo of Moore's Swamp Thing). This conflict exploded in the "Elemental War" storyline, where just as Firestorm decided he was "humanity's friend," environmental activist Mai Miyazaki became Naiad, a new Water Elemental who teamed with the Air Elemental, Red Tornado, against humanity. To end the conflict, Firestorm allied himself with the Swamp Thing. This arc, in issues #90-93, was a visually arresting tour de force which was done a disservice on newsprint. I'd really like to see this arc--and much of Firestorm, to be honest--in a deluxe format. Someday, someway! Did you think that the final metamorphosis of Firestorm was passed? Au contraire, mon frere! Martin's plan tied into the fact that, as established in "Soul of Fire," he was to have been the original host to the Fire Elemental. In his words: "I propose we use one of these craft, equip it with oxygen tanks...and a quantity of explosives. Firehawk and Firestorm then supply sufficient thrust to put it--and me--into orbit. We detonate the explosive, ending my and Firestorm's lives...and hopefully, re-creating us both into a new Firestorm...who is then free to journey to the sun. In theory, anyway." Before Firestorm "died," however, he released his component halves, powerless, and they reunited with their families. Svarozhich then helped Martin complete the plan. The theory worked; not only did Svarozhich, possessed of the Fire Elemental, perish as it broke Earth's atmosphere and Martin become the new Firestorm, but Martin-as-Firestorm regained all his lost memories. This new Firestorm then defeated Brimstone, but found himself sucked into a singularity and into a "new universe" where he could not find a way home. He thanked the Earth-mother, Maya, for the experience and went off to parts unknown while Ron Raymond explored a new life with Lorraine, and Mikhail reunited with his wife Nina. One thing was sure: although he was nowhere near, they were sure Firestorm still lived! I may have made a tiny tactical error in reading Firestorm #100 before issues #86-99, but that doesn't diminish my opinion of the final issue. 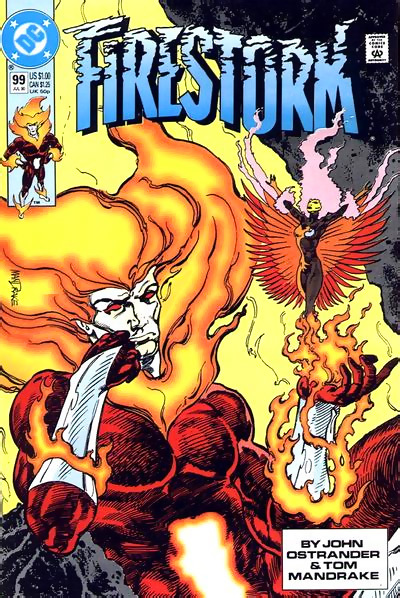 The issue in many ways brought the saga of Firestorm full circle, summing up everything the character had come to mean since his introduction and tying up the plot thread that had been the through-line of Ostrander's entire tenure, summed up by Lorraine in the final story: "Funny, here they spend all kinds of money trying to determine if powers make one a hero. And the definitive answer [Martin Stein] is walking around on two feet...and most people never noticed him." Although for the longest time, Ron Raymond was the focus of the Firestorm series because his personality was ascendant, Martin was no less a hero, and with this issue he had his chance to prove just that. 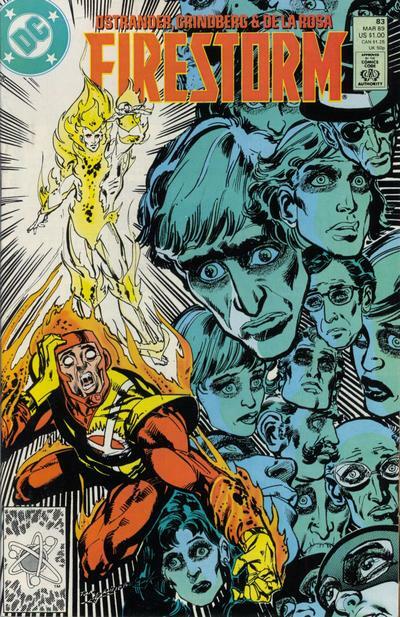 Interestingly, as the early Conway period would prove to be about the maturation of Ron Raymond, the Ostrander run framed the entire series as the maturation of the Firestorm entity, culminating in the eradication of the original dual-personality Firestorm and the coronation of Martin Stein as the "one, true" Firestorm. Not until the final issue was Ostrander done with his changes, which definitively established the Conway years as the character's larval stage, and the vast majority of his own tenure, kickstarted by the arc in #62-65, as his puberty. In "Soul of Fire," the "new" Firestorm may look different--certainly more like an adult as opposed to the garish costume seen before--but he wasn't fully mature until Martin took control. Even now, I'm awed at how well the whole story fits together, with organic change built upon organic change. Even if you don't like the finished product of Martin-as-Firestorm, you have to admire the method by which Ostrander slowly yet drastically changed the character. As you can tell, the Ostrander run of Firestorm is one of my favorite comic eras of all time, and the letter columns in those last few dozen issues are filled with the opinions of the foremost letterhacks of the period, such as Jan C. Childress, "Uncle" Elvis Orten, T.M. Maple, and Charles J. Sperling, whose deep opinions speak to the high quality of the creators' efforts. It's entirely fitting that Ostrander's lasting legacy with the Firestorm character, for better or for worse, is the introduction of the Matrix. It has been used in nearly every Firestorm story or pitch that has been put forth since 1990, by subsequent writers like Joe Kelly, Mike Carey, Dan Jolley, Stuart Moore, and current Firestorm co-writer in Brightest Day, Geoff Johns. That alone speaks to the durability of Ostrander's concepts. Next: Back to the beginning with Gerry Conway and friends.